The laughter starts before anyone comes out on stage, as we hear the actors backstage at the Black Box Theater at the Cotuit Center for the Arts, loudly wondering where the rest of the cast is. We smile at a woman’s exasperation as she learns two of the actresses are in Hyannis, held up in a traffic jam. 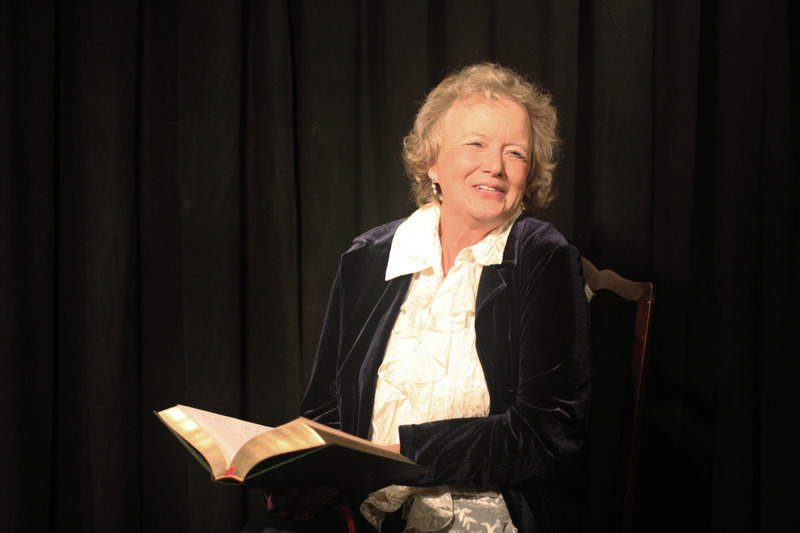 Diane Quaid reads a Christmas story by Robert Benchley. 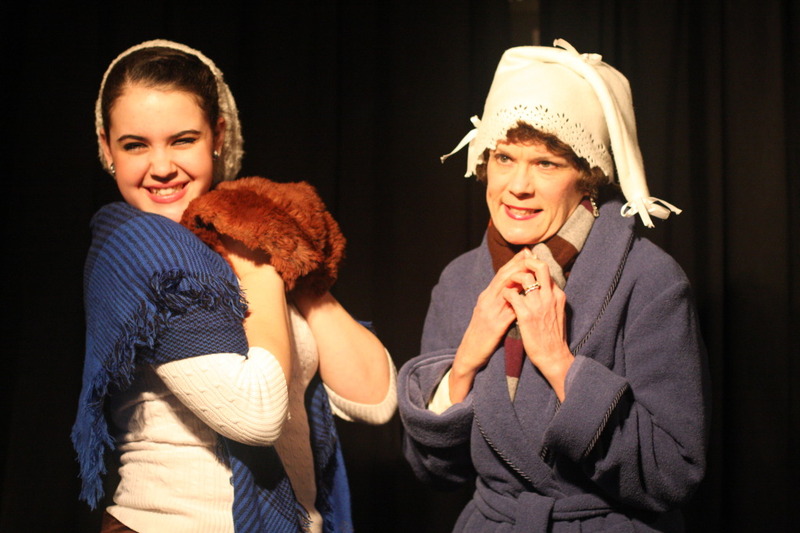 All photos by Daniel Fontneau, Cotuit Center for the Arts. Ms. Quaid gives a delightful (and very professional) reading of “Christmas Afternoon,” temporarily abandoning her scatter-brained Phoebe persona to give a warm and humorous performance. Known not only for her acting skill, but also for her readings at the Woods Hole Public Library and other Cape Cod libraries, Ms. Quaid knows how to bring a good story to life. Still waiting for the missing actors, Phoebe starts auditioning audience members to play the role of Scrooge. Just as she is about to settle on someone, the delayed actors finally arrive. 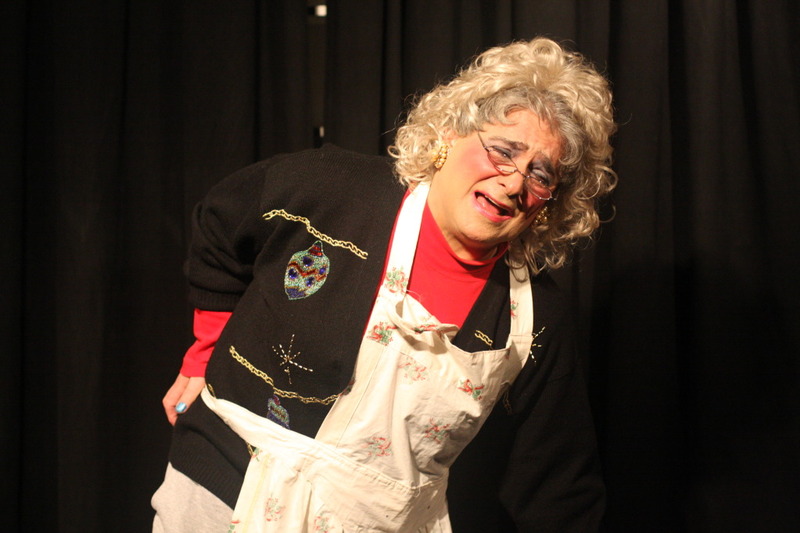 Mrs. Stephen Doyle plays Thelma Greenwood, the brusque, humorless woman who is perfectly cast to play Scrooge. Ms. Doyle is excellent in this role, enriching it with subtle touches, as when she (as Scrooge) refers to the traces of dirt beneath his fingernails and gives a sly little glance to her own bright red polished nails. Felicity is played by Hannah Carrita, an engaging young actress from Sandwich. A junior in high school, she plays her several roles in the play-within-a-play with an ebullient Valley Girl sort of energy and style, excited to be on stage and playing to the audience. 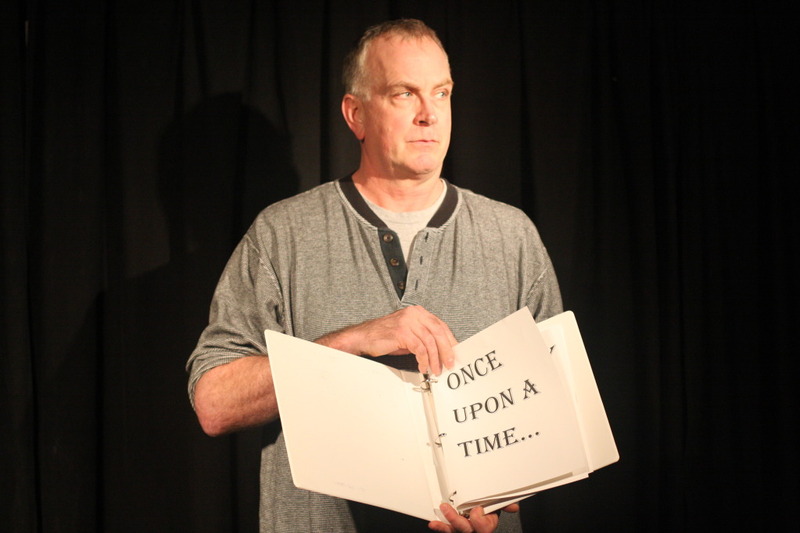 Glenn Wall plays Gordon Pugh, who is reluctantly involved in the play. His laid-back acting style is very effective, and he is very funny as the door knocker face of Marley and in other roles. Cleo Zani as Mercedes — you can feel her pain. Cleo Zani plays Mercedes, a woman who, in full makeup and ornate earrings, plays several male and female characters, sometimes hurriedly donning his skirt inside out. The only problem is that Mercedes has been injured in a recent shopping cart pile-up and is in severe pain, downing more and more pain killers as the play progresses to keep it together. Mr. Zani is so convincing that you can feel her pain, and it can feel very uncomfortable. Ms. Quaid’s Phoebe also plays several roles in the play, including Tiny Tim, but never puts down her oversized floral handbag. There are some very funny moments in “Christmas Punch,” and some very effective visual scenes, as when several characters throw snowballs at each other—big, heavy beanbag snowballs that just thump on the floor. The portrayals of the Spirits of Christmas Past, Present, and Future, are also fun, and very creatively done. The contemporary music played during scene changes is appropriately jarring. Yet, sometimes it feels as though the play is overacted, or overwritten, that it tries too hard. Sometimes, one just wants to see the classic tale unfold, without the constant and glaring ineptness of the members of the Dramatic Society. A more subtle approach might improve the play, especially in the relatively confined space of the Black Box Theatre. Even so, the show is a positive beginning for Ms. Garner’s new theater company, and we look forward to her future productions. “Christmas Punch” continues on Friday and Saturday evenings at 8 PM, this Saturday also at 4 PM, and Sunday afternoon at 2 PM. Tickets are $12 and may be purchased by calling 508-428-0669 or visiting cotuitarts.org. Tickets may already be sold out for the run of the show, so do call ahead.